I feel pretty good, physically, and like a million bucks, mentally. My morning didn’t start well. We drove our new car — my first time ever riding in it! — and parking was already full. We knew we should have left sooner, but whatcha gonna do. So, we drove around looking for street parking which was harder than it should have been. All the street closings and pressure to find a spot made us go the WRONG way on a freeway exit ramp! GAH! Cars were flying towards us honking, trying not to have a head on collision. Luckily it was 6:30 AM on a Saturday and traffic was light. We managed to turn around, find a spot and high tail it to the starting line. Being late and shaken up, we didn’t get to stretch or buy bananas. That said, it went well. It was hot & humid to be sure, but there was a nice breeze in some spots. I stopped at every water station as recommended by a few articles I read for 1st time half-marathoners. My shoes were SOAKED by the end so my feet felt mushy & gross. It wasn’t painful, just a distraction. 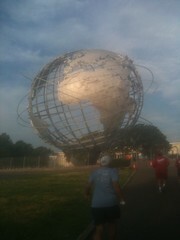 The best part was seeing all the new sites of Flushing Meadow Park where much of the race was held. (Photo set here.) I ran past the Unisphere, an Aquatic Center, the Queens Zoo, Citi Field, Arthur Ashe Stadium and lots of lovely marsh land. Who knew it was all down the street from me? I came in 2435th place overall and 115th in my age/gender group. Finished in 2:20:22 at a 10:43 pace. Christian did well, too. Came in 999th place overall and finished in 1:56:56 at a 8:56 pace.